Feeling the ramifications of holiday indulgence or those continuous bad choices you make at the food court during your 15-minute lunch? What you need is a bowl of warm quinoa with maple sweet potatoes and spicy chickpeas, or a macrobiotic plate of fresh veggies, brown rice and greens garnished with a creamy avocado dressing, all delivered directly to your door. These same plates are constantly Instagrammed by models like Chrissy Teigen and Lily Aldridge, and have helped thousands of unbalanced eaters regain the nourishment they need to live a healthy life. What started out as a quest to reclaim two women's health, bodies and appreciation of food has transformed into a widely successful, continuously growing lifestyle brand. Within the first few days of 2016, Sakara Life has announced a $4.8M Series A funding, which will be its first capital influx since 2012. Sakara Life launched in 2011 as an organic, nutritionally focused meal service, where fresh, balanced breakfasts, lunches and dinners are delivered to your door. The program has developed to help ensure that clients are getting the most out of the food they are consuming by providing nutrient-dense cuisine paired with thorough information about why this food is good for you. Founders Whitney Tingle and Danielle DuBoise both grew up in Sedona, Arizona, which they describe to be a “powerful place and spiritual mecca with a strong mind body and food connection”. When they individually moved to New York, that connection was lost. Whitney started a career in finance, where the hours, stress and limited options of healthy food took a toll on her body. Danielle pursued a career in acting, which strained her relationship with food. She found that food was more a cause of stress than a source of nourishment, and began to remedy that with the master cleanse and juicing. Frustrated with their disconnect, the two decided that there had to be a better option out there than doctor-prescribed medicines and extreme diets. Whitney and Danielle teamed up to figure out how other people heal themselves. The two sought out every shaman, nutritionist, yogi and healer they could find and picked their brains about how to live a balanced life. They began testing these teachings, being their own guinea pigs for recipes and concoctions with the goal to find out what would make them appreciate and nourish their bodies and feel like the best version of themselves. They read everything they could get their hands on and Danielle went to school to study nutrition. What did they determine to be the key after discovering a core value of all these different systems? Eating whole, fresh foods. “The American diet has become reliant on packaged, easy food, which has messed with our bodies. We thought we were eating healthy by buying trail mixes and granola bars, but all of these things are really dehydrating. What we really needed was real food, fresh food that was made every day." Their discovery of the change that real, hydrating food can make was something they wanted to share with a city populated by so many people starved for clean meals. Instructing these people on what to consume was the first step, but the time, energy and stress of actually creating those meals is what keeps people from sticking to the plan. As Whitney explained, "People buy all these amazing groceries, beautiful vegetables and fruit, but are exhausted. You get caught up in life, time passes, and this amazing food you have in your fridge is no longer good. It can take up too much brain space and time to monitor what you are eating, adding stress to something that shouldn’t be stressful. We wanted to make it a no-brainer." The Sakara Life program offers breakfast, lunch and dinner, a morning water with rose oil, and a night water with trace minerals and chlorella. 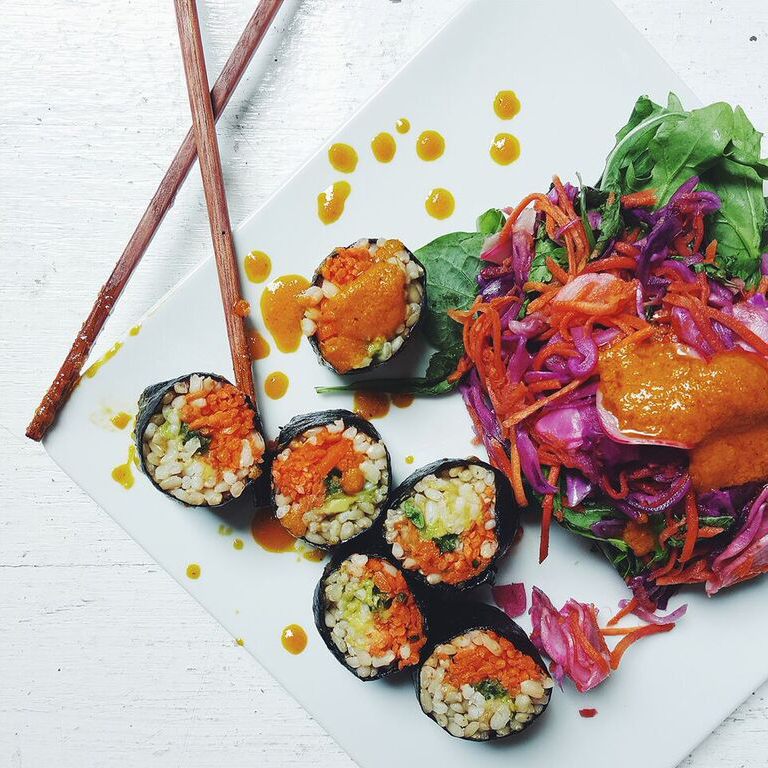 All meals are vegan, organic and beautifully plated, like the Eat-the-Rainbow sushi stuffed with avocado, beets and brown rice or the ridiculously good spicy turmeric carrots over a bed of arugula with wild rice and oranges. And while the dishes are nutritionally balanced, they also ensure that they are tasty and gourmet. Chef Bobby Flay is on their advisory board and Sakara Life is constantly sourcing new chefs from high-profile restaurants like Le Bernardin and Jean-Georges to help them out. "We don’t use gluten or soy and everything is plant-based, so you have to get really creative. And eating this way has become more and more popular with chefs. They bring their experience of high-end cuisine to this new style of eating," explains Danielle. In addition to meal delivery, Sakara has an online store that ships nationwide. The newly revamped Clean Boutique is like a new wave grocery store, with fresh-made health bars, muffins, granola, waters, supplements, chocolate, even cookies. The boutique goes beyond just food, offering beauty products and home goods. "Food was the catalyst for change for us, but now it has opened our eyes to the shampoos we are using, the products we have in our home, even our sheets. The goal of the boutique is to keep it clean but luxurious. We are not just shipping kale,“ Whitney describes. The cofounders also stress the importance of understanding what you are eating, which is why they also publish the S-Life magazine—a well of information on clean eating, with recipes and tips. With continuous rapid growth, their biggest challenge isn’t managing new markets, it is working with nature. Knowing that kale isn’t going to be vibrant green all the time, and respecting that the shelf life of cabbage creates a lot of sulfur. The team sources all of the fresh vegetables and fruits directly from farms so that the ingredients in the meal deliveries are more fresh than what you buy in the grocery store. This hasn’t slowed the growth of the meal delivery program that now has a presence nationwide, delivering almost 40,000 meals monthly, a number that is expected to double this month. Check out Sakara Life and get on the road to clean eating.